Describe your work in two sentences or less. 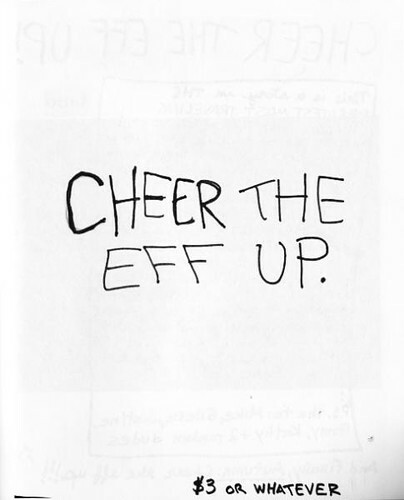 Cheer the Eff Up is a zine about punks, depression, suicide, fatherhood & cake. It’s sad but also kind of funny. Where are your favorite places (in your neighborhood or online) to find new zines? My very favorite is Quimby’s in Chicago. On the interwebs, Portland Button Works is fairly awesome. What are you working on for the Fest this year? Right now I’m working on the last issue of Cheer the Eff Up, #6. Hopefully, I’ll also be finished with Live Punk, a zine about pop punk. It’s a bunch of interviews with artists from bands (not necessarily even pop-punk related) that I dig, like Naked Raygun, Tilt, Screeching Weasel & Henry Rollins. How did you get involved in making zines? I started in high school, writing all this silly, angsty, damn-the-man stuff with friends. We called it quits after a little while, but zines never really left my mind. Fast forward many years; on a whim, I went to the 1st Chicago Zine Fest. It was a HUGE wake up call. I was blown away by how big & thriving the zine community was. As a kid, I thought of zines as a local thing, you know, to pass around among a few friends. I hadn’t realize that people were linked all over the world through zines. I started working on Cheer the Eff Up #1 soon thereafter. It was going to be just a thing to cheer up a friend, & I guess to think about fatherhood. It quickly became a bigger project. What’s your favorite part of LA Zine Fest? I love sharing my zines, but my favorite part is just reconnecting with good friends at the fest. I’ve met some really incredible people through zines; I both treasure them as friends, & admire their work as zinesters. Tabling at zine fests are often the only occasions when I get to see them again. It’s like a big reunion.